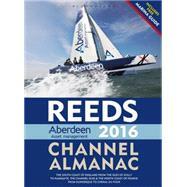 The Reeds Channel Almanac covers the south coast of England from the Scilly Isles to Dover, the Channel Islands and northern France from Calais to L'Aberildut, offering cruising and racing yachtsmen ready access to essential navigation information by virtue of its clear layout and user friendly format. Completely updated for 2016, topics include seamanship, pilotage, tide tables, safety procedures, navigation tips, radio, lights, waypoints, weather forecast information, communications, Mayday and distress procedures - in fact everything the cruising yachtsman needs to know. The spiral binding allows the Almanac to be opened flat on the chart table and the large type size and clear layout makes information easy to read even in adverse conditions. This handy volume is ideal for anyone cruising the length of the English Channel.